Inspired to build a successful eating disorder awareness and prevention program on your campus? We want to hear about it! College Hope is a national collegiate initiative to promote eating disorder awareness and recovery on college campuses. In an effort to share ideas between schools and provide easily accessible resources for eating disorder treatment and information, we are gathering resources and counseling center information from different schools to publish here for students seeking help. We welcome your input and applaud your spirit of collaboration to support college students struggling with eating disorders! Contact us to share your school’s eating disorder resource information. Join Our College Hope Club! Project HEAL Ohio State is a vibrant on-campus resource for students in recovery or otherwise looking to support the eating disorder community. Eating Disorder Hope is proud to be a Bronze Sponsor of Project HEAL Ohio State’s 2nd Annual Gala, taking place in February 2017. Click here to donate or visit their Facebook page for more information! Through the B’Well Health Promotion and student organizations like Project LETS, Brown University takes mental health advocacy seriously. Peer mentors and workshops give students struggling with eating disorders an opportunity to express what they are going through and seek help. Click here for more information. The Student Wellness Center on the Dartmouth campus encourages mental and physical health for all students. The center focuses on prevention and early intervention for eating disorders by providing resources such as the Thriving Together Wellness Peer Support program. Click here for more information. 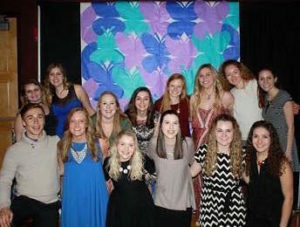 TCU has various programs and events that aim to combat body image issues and encourage body positivity. These include The Body Project, a student organization on campus, and the annual Feed Your Body and Soul Week. Click here for more information. GW has a vibrant on-campus community for eating disorder advocacy. Click here for more information. The Eating Disorder Treatment Team, an active student-run chapter of Project HEAL, and free nutritional counseling are just a few of the many eating disorder recovery resources available to students at The Ohio State University. Click here for more information. Check out on-campus resources from our non-profit partners! Eating Disorder Hope is pro-recovery. We invite you and your campus to join us in our efforts to promote online health, hope, and healing among college students struggling with eating disorders by joining our movement. More details at the Eating Disorder Hope Pro-Recovery Movement. 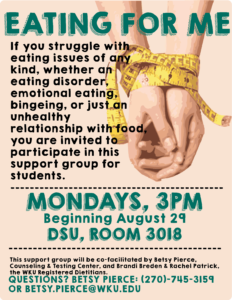 Western Kentucky University (WKU) hosts an on-campus support group called “Eating for Me.” This weekly group led by registered dietitians supports students struggling with eating disorders, emotional eating, bingeing, or simply unhealthy relationships with food. Though you have likely been following a meal plan designated for you by a nutritionist, the new environment of a college campus and different availability of food can challenge the structure you have been so careful in following. Read more here. Weight and grades both provide “numbers” that can become external markers for change. Rigid or all-or-none thinking can be applied to these numbers to help simplify the complexities of life on campus. Read more here. The CollegeResponse program, developed by Screening for Mental Health(SMH), promotes the prevention, early detection, and treatment of prevalent, often underdiagnosed, and treatable mental health disorders and alcohol problems. For more than a decade, this program has offered affordable and practical risk management tools and information that educate, assess, and connect students with appropriate resources. Your campus health and counseling center has limited capacity. So how do you focus your resources on the students most at risk?